After all the sweet bakes for past few challenges, Priya of Priya's Versatile Recipes suggested some savory muffins for this month's Home Baker's Challenge. I love savory muffins and quick breads, especially warm and fresh from the oven. 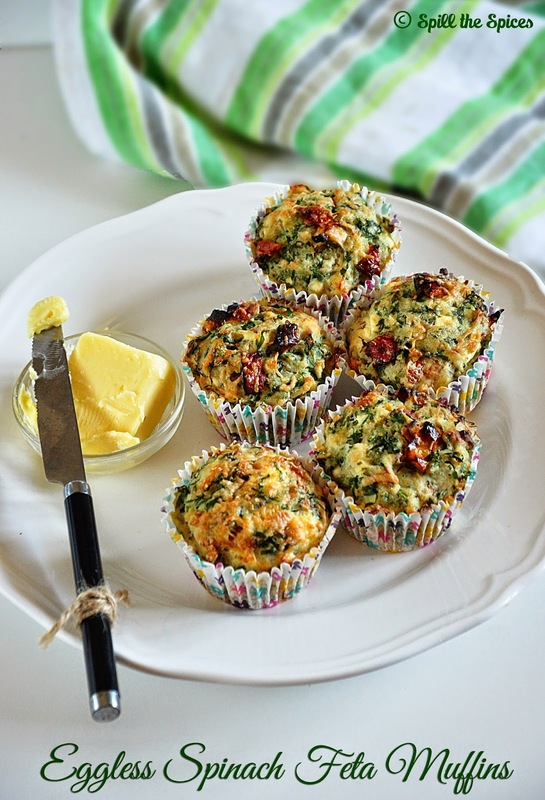 This time I had no dilemma in choosing the recipes as these spinach and feta muffins have been on my list to try for long time. 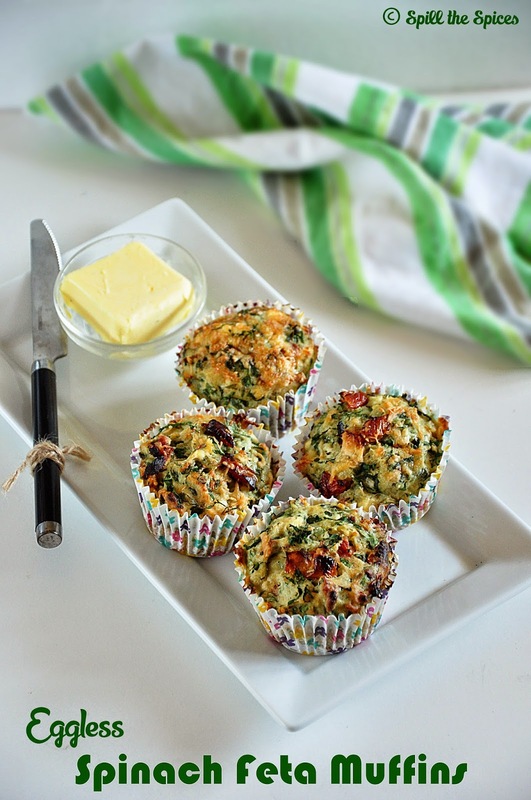 These muffins loaded with spinach and feta cheese turned out so light and fluffy. You could have them by itself, but a little dab of butter takes the muffins to another level. The sun-dried tomatoes add a freshness and sweetness to the muffins. I had spiced it up with some cayenne pepper and black pepper powder. Overall it's a delicious muffin to have for breakfast or evening tea. 1. Wash the spinach well to remove any dirt / sand and dry them well. Trim off the stems and chop them finely. 2. Preheat the oven to 200 C | 400 F. Line a 12-cup muffin pan with paper liners or grease and flour the pan. 3. In a large bowl, sift flour, baking powder, baking soda, cayenne pepper, pepper powder. Add spinach, sun-dried tomatoes, feta, 2 tbsp parmesan and stir to combine. 4. In another bowl, add milk, yogurt, melted butter and whisk until well combined. Add this to the flour mixture and mix with a spatula until just combined. 6. Fill each muffin cup about ¾th full. Sprinkle the remaining parmesan over the muffins. 5. Bake for 20-22 minutes or until a toothpick inserted in the center comes out clean. Place the muffin pan on a rack and allow to cool. Do not over mix the batter. Just mix until everything is combined. I didn't add extra salt as the feta cheese was salty enough. If you don't have sun-dried tomatoes, substitute with seeded and chopped tomato. Loved these savoury muffins..very colourful muffins. 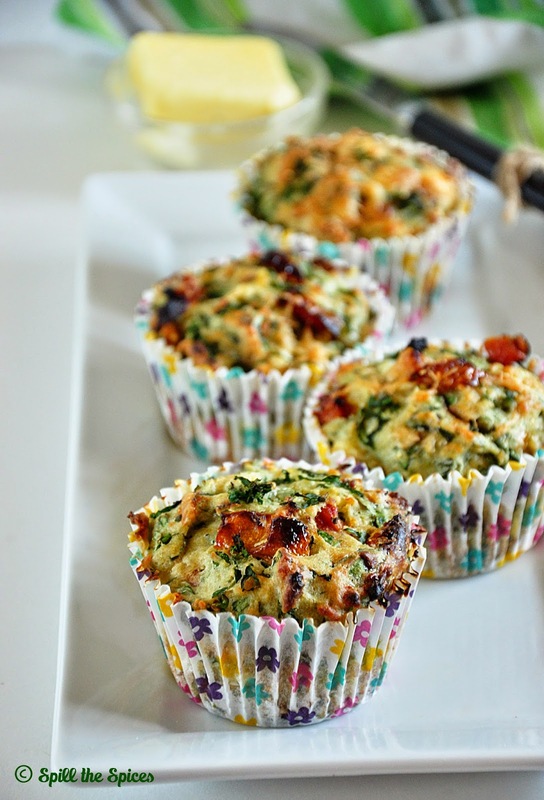 Lovely savoury muffins, looks so cute! Beautiful clicks!! Goodness of spinach and cheese, a perfect breakfast!!! Love those muffins in colorful liners. Lovely breakfast muffins. So healthy and delicious. I too like savoury kind of muffins. Delicious and healthy muffins..
Nice pics.. the muffins looks delicious and the combination of cheese and spinach sounds wonderful.. I love the sound of these savory muffins.Beautifully clicked too. The muffins look so colouful...Love it... it would make a perfect breakfast option..